The piece, which is called Petrushka Reloaded, is for the kind of weird little ensembles I cobble together (a quartet this time: SPD & feedback station, electric guitar, vocoder & midi heaven, singer & toys), plus one hundred actual people with real instruments. Thanks to Konstantin and Pauli at the orchestra for their stewardship, and to the indefatigable Christoph Altstaedt and Simon Nathan (who has like literally done Rick Wakeman’s arrangements) for taking my half-baked, chamber-weirdo croonfest and exploding it into something that sounds actually rather like the old master. So fun. There’ll be mad projections from Stanisław Zaleski, too. March 7th we’re at the Philharmonic Hall, Szczecin, March 9th at the Konzerthaus, Berlin, and June 5th we play the Elbphilharmonie, Hamburg twice in one day. Bonkers. More travelling with my pal Raymond, this time on a train that went on a boat, to Copenhagen’s lovely Mayhem spot. Big thanks to Danielle Dahl for the invitation, and the awesome mini hamburgers. Raymond and I also paid a visit, at long last, to the distant lands of Lithuania, and specifically to the AHEAD electronic music festival. Cheers to Vitalija Glovackyte for the hook up, to Edvardas Šumila and Dominykas Digimas for the wintry fun, especially the rather nifty afterparty in the old railway station. Second, in a new and marvellous development, the fine folks of Berlin’s junge norddeutsche philharmonie have asked me to write a 30’, brightly coloured ode to Stravinsky’s Petrushka for performances next year. 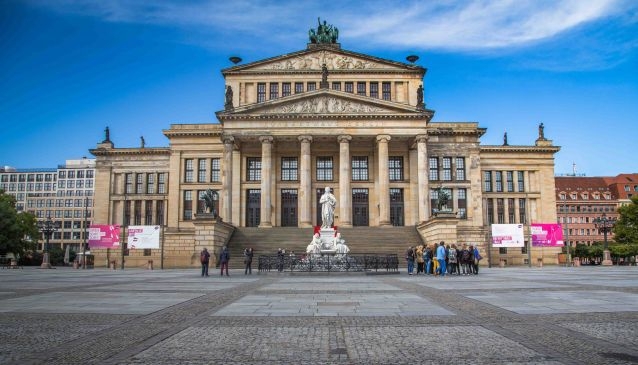 Among a bunch of other spots, it’ll be at the Philharmonic Hall in Szczecin, Berlin’s Konzerthaus and Hamburg’s Elbphilharmonie, all of which is in equal measures thrilling and terrifying. I’m thinking an abstract portrait of Igor’s little puppet as a heartbroken manic dude, with lots of vocoder. I’m also thinking of that Orchestra Hit sound from those keyboards we had at school. Mmhm, this one. Finally, two homeboys have records out! You can get Michael Cutting’s beautiful tape machine studies here, and Laurie Tompkins’ explorations of the furthest reaches of Netflix and synth with cellist Ollie Coates, here. Rejoice! A fun couple of months bouncing around with four different pieces. Who is Raymond? happened at Manchester’s wonderful Wonder Inn; thanks to Vitalija Glovackyte for the invitation! It also happened at New York University’s Waverly Project as part of ACM ensemble’s residency there, and again with Kinder Meccano at Casa del Popolo in Montreal; thanks to Noam Bierstone and his NO HAY BANDA series, and all of the marvellous audiences. Together, ACM and I gave Fleck Flob Flop its US premiere at National Sawdust in New York, which was every bit the great show we hoped it would be. Thanks to everybody who came out and was a part of making it that, also to Nico Muhly, Courtenay Casey, and Katie Jones for looking after us so amazingly, and to Michael Cutting and Vitalija Glovackyte for being game. And to Robbie Gardiner (below) for playing clarinet like a boss with lips bloody from the cold. Finally, after Aldeburgh Music (May) and Café Oto (December), The House of Bedlam gave Disappointment & Small Relief (Hospital Scenes) its third outing at the Leggate Theatre, erstwhile home to public autopsies, in Liverpool. Some serious synergy between site, sounds & band name right there. Gigantic thanks to the ensemble and to Larry Goves, as ever. I’m taking a break from regular shows for the next twelve months to finish the follow-up to 2015’s Brittle Love, which y’all can still get at the link you just read past. It’s tentatively titled Joyrobix, and will be touring all of Europe and North America in spring 2019. With my little sister, which is the most exciting prospect. In early September, 50 artists and musicians came together for the first ever VERANTWORTUNG 3000, a weeklong self-curated residency in Brandenburg organised by the power trio Andreas Dzialocha, Malte Kobel, and Laura Weber, the folks who run BLATT 3000 out of Berlin. It was an amazing and life-affirming thing that happened at an old distillery near the German-Polish border. I presented a test run of a 25′ piece I spent a fair chunk of the spring working on while studying with theorist and musician Eldritch Priest in New York. The premise is simple: the protagonist, to whom I bear striking resemblance, finds a scrap of paper on the New York City subway that reads ‘Raymond looking for work’ and that includes a phone number. Following weeks of speculative sleuthing and a couple of emails, he heads off on a wild goose chase across the American south in search of the note’s author and an explanation for the trail of clues it leaves behind. Half film documentary, half music-theatre piece, Who Is Raymond probes the line between truth and fiction, and between staged interventions and real life. Do these binaries even hold water when put to the test? Major thanks to the dozens of festival attendees who took the time to offer feedback on the edit. Here’s an excerpt from the middle of the piece. Who Is Raymond? is set for a performance-lecture outing in Toronto in November at Eldritch’s Tuning Speculation weekender, and a longer, deconstructed version for Delia Stevens and Abel Selaocoe on percussion, cello and sundry digital devices is on the cards for a wee portrait concert touring the UK in the summer. Finally, a couple more Tired Music shows: at Shapeshifter Lab in Brooklyn in October with Fede Camara Halac and Jessica Rosen, and at Transpecos in Queens in November with David Meier & company. Woop. So many people came together to make this thing happen. Thanks first to Hand Of, and then to the University of Sheffield, Sheffield Town Trust, Arts Council England, and the Yorkshire Film Archive. Sick to have been a part of it. Check out the film, along with work from all over the world, between November 3rd and 6th. I made a new live-typed text piece called Disappointment & Small Relief: Hospital Scenes, which tells the story of a doomed romance between Our Hero, a photosensitive in-patient at an eye clinic, and You: an ophthalmologist with a strobe-like smile. ‘Each passing day is one thing that is not another: Your ecstacy, and Our Hero’s worsening condition.’ Pretty sad, slightly happy, with drum machines and crass synths and saxophone and a piccolo for good measure. Viddy to follow, here for now is the second movement, in which our two protagonists fall fast and hard and head over heels. Very warm thanks to Larry Goves, Harry Fausing Smith, Kathryn Williams, Steph Tress, and Tom McKinney for their skills, and to Aldeburgh Music for their amazing hospitality. A bunch of tunes from Disappointment & Small Relief will make it in some fresh fashion onto the forthcoming LP, a manic 45-minute odyssey tentatively titled JOYROBICS, and on track for a spring release. Shows with The House of Bedlam in Berlin and NYC to follow, but first up is at London’s Café Oto on December 5th.